We have this hope as an anchor of the soul, firm and secure. What a comforting verse! I came across it this morning in my reading and was instantly drawn to it. 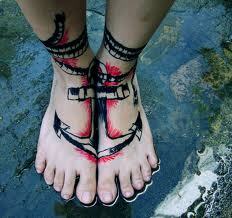 Some people think of these synomyms of an anchor: confining, binding, constraining, controlling, etc. But these synonyms fit an anchor (something used to hold something else securely) of the soul: safeguard, protection, support, comfort, defense, mainstay, pillar. Amidst the storms of this life, I am so grateful for and comforted by the ANCHOR OF MY SOUL. Hold me securely, Lord. You know that maddening experience when you walk into a room to do/get something and have totally forgotten why you were there? The good news is that you’re not having a “senior moment” or worse. There’s a scientific explanation! And you can place the blame on the DOORWAY! If you’re a total geek, you can read the study here. So if God “remembers our sins no more,” then we need to do the same. Not only for others, but also for ourselves! Last night during the wee hours of non-sleeping that I occasionally often experience, I found Joyce Meyer on TV talking about Pressing Past Guilt and Shame. I found a Part 1 (Learn to live with a “righteous consciousness” rather than a “sin consciousness” so you can get rid of the past and move toward your future) and Part 2 (Move beyond negative emotions and begin enjoying who God created: YOU!) online. Oh yeah…just another GC. She speaks of satan telling us -and our agreement with him – of all the things we are NOT. Jesus wants us to forget all that…and remember WHO WE ARE IN HIM! Let’s walk through that Doorway and have an “event boundary” experience. Early Saturday morning. Brain still not completely awake. Pouring rain. I try to read my directions without crashing the car and realize I missed my exit. I pull over, reconnoiter and decide to find next exit, re-enter the I-5 South, exit, re-enter I-5 North, and finally take the exit for the road I needed. Although this scenic route only added about 5-10 minutes to my trip, I’m now truly annoyed, tense, and concerned that I will be late. Not a good thing. Soon I see slowing traffic, flashing red lights, someone on the freeway directing cars to the far left lane. Steam rising up from the pavement, adding mystery and a sense of dread. Three cars scattered across the road, smashed and dented, with the focal point: a car upside down. People standing at the edge, comforting each other. As my brain wakes up, it understands that this accident had happened only minutes before. There is single police car. One officer lining up orange cones, isolating the scene. Another officer with those involved. No ambulance, no paramedics. First thought: Oh, no. I pray no one’s hurt badly. How scary! Second thought that closely follows: That could have been me. How scary! Missing my exit…was it my mistake? My lapse in attention? Or was I being watched over? Guided? Protected? Now please don’t misunderstand me. I don’t believe that God likes me better than those people in the accident so He protected me and not them. But I choose to believe that He has a plan for me that didn’t include that accident. Don’t know why or what. I do know that I was able to share that story with someone who believes there IS a God, who knows ABOUT Him, who was influenced by my belief in a God who CARES about me and has a plan for me…. How many times are the annoyances and inconveniences in our lives actually Divine Protection or God’s Direction? Do we realize that there is more going on behind the scenes? Do we believe that God sometimes “re-routes” our trajectory for a good reason? Don’t we usually think we’re in control and feel a little cranky when our plans go awry? “For my thoughts are not your thoughts, neither are your ways my ways,” declares the LORD.” And sometimes that has to be enough, I guess. BE ALERT, BE GRATEFUL, BE TRUSTING. Just another GC: This was written last week (just not published)….for certain people who may be wondering…Jesus, You rock!